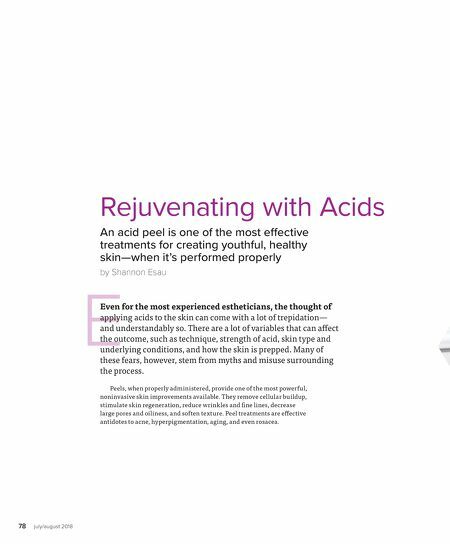 78 july/august 2018 E Rejuvenating with Acids An acid peel is one of the most effective treatments for creating youthful, healthy skin—when it's performed properly by Shannon Esau Even for the most experienced estheticians, the thought of applying acids to the skin can come with a lot of trepidation— and understandably so. 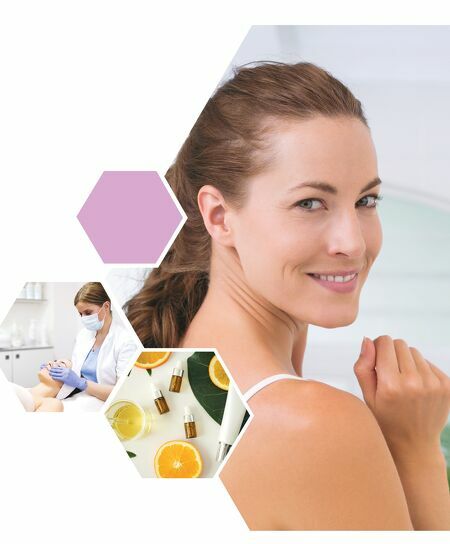 There are a lot of variables that can affect the outcome, such as technique, strength of acid, skin type and underlying conditions, and how the skin is prepped. Many of these fears, however, stem from myths and misuse surrounding the process. Peels, when properly administered, provide one of the most powerful, noninvasive skin improvements available. They remove cellular buildup, stimulate skin regeneration, reduce wrinkles and fine lines, decrease large pores and oiliness, and soften texture. Peel treatments are effective antidotes to acne, hyperpigmentation, aging, and even rosacea.